Every time we were asked out to dinner by Chinese people living in Sichuan, we went for hot pot. 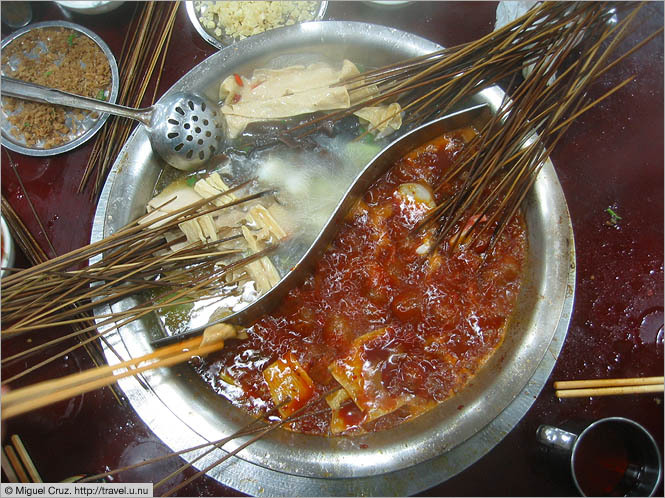 Basically, everyone gathers around a bubbling cauldron containing an extremely spicy mix of oil and water, and then all sorts of stuff gets thrown in - tofu, mushrooms, duck lips (no kidding), what have you. At some places the food is on skewers (as pictured here), so you can just pull it out to eat it. In other places they dump plates of raw food in, so everyone fishes bits out with chopsticks. It's very social and communal, and the meal always takes a very long time. The photo above was taken in the middle of a meal for four. When we were all done, the waitress counted up the empty skewers on the floor under the table (about 180 of them) and charged us US$4.